Home › Electronics › Waterproof Case Floating Tpu Phone Bag For Smartphones To 5.7 Inches Includin..
Waterproof Case Floating Tpu Phone Bag For Smartphones To 5.7 Inches Includin..
Universal size WATERPROOF CASE bag fits all smartphones up to 6.25 inches tall and 3.25 inches wide. Keep your phone, along with your ID, credit cards, wallet, money or other personal items dry and clean in this waterproof dry bag perfect for the pool, beach, fishing, skiing, waterpark or anywhere else where you want to keep your phone from getting damaged by water or other elements. Compatible with the latest devices including iPhone 7, 7 Plus, SE, iPhone 6s, iPhone 6s plus, iPhone 6, 6 Plus, 5, 4, Galaxy Note 7, 5, 4, 3, 2, edge, S7, S7 edge, S6, S6 edge, S6 edge plus, HTC One M8, M9, Motorola Moto G, Moto E, Moto X, Droid Maxx, Droid Turbo, Moto X Pure, Droid Maxx 2, Droid Turbo 2, HTC Desire, Nokia Lumia. Windows Phone, Moto X, Nexus 5, Sony Xperia Z3, Z2, Z1, Honor 6, OnePlus 2, LG G3, G4, and many other phones and electronic devices. GearDry TPU Float Case does what it says keeps your GEAR DRY! 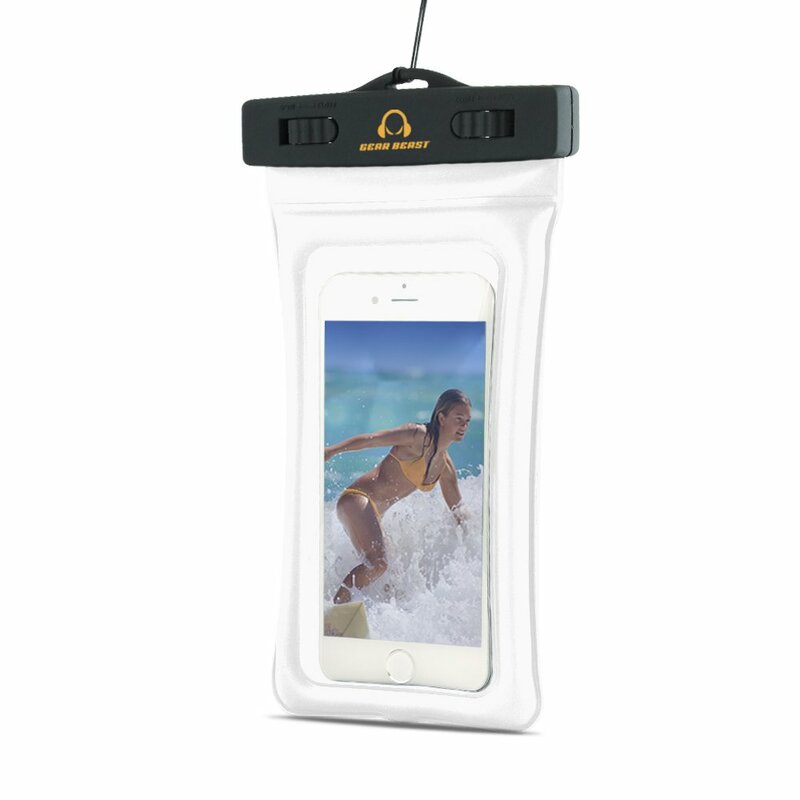 The Gear BeastGearDry TPU Float is the perfect waterproof dry bag for taking your phone tothe pool, the beach, fishing, skiing, the waterpark or anywhere else yourphone could be damaged by water, snow, dirt or other elements. This universalcase accommodates all smartphones up to 6.25 inches tall and 3.25 inches wideand still has plenty of room to keep your ID, credit cards, wallet, money orother personal items secure, dry and clean. Certified Waterproof and Designedto Keep Items Afloat The GearDry waterproof dry bag is IPX8 certifiedwaterproof to 10 feet so rest easy if junior accidentally (or intentionally)drops it in the pool. The secure seal and durable TPU waterproof materialswill keep your phone and other items dry and protected. And with the SPECIALLYDESIGNED AIR FLOAT FEATURE, the case, and its contents, will stay at thesurface for easy retrieval. Protection without Limiting Access Designed tokeep up with your active lifestyle, the GearDry case is constructed of crystalclear waterproof TPU material that allows full touch screen access so that youcan check emails, texts or surf the web. Need to keep up with the action? Theclear front and back allows you to take pictures and videos without removingyour phone from the waterproof case. Designed for Convenience When you do needyour phone or other items you can access them in a snap! The innovative duallatch design is easy to open and close when you need to remove your items orsecurely seal them back up in a hurry. For further convenience, the case comeswith a lanyard for hands free transport. One Year Warranty and Great CustomerService Customer satisfaction is our top priority. Please do not hesitate tocontact us if this item does not meet your expectations.